The Healing Tree is a vein of humanity with the noted purpose to make an effective difference. Established in 1990, they have serviced universal devastations while providing and maintaining a wide range of services. They maintain a vigilant consistent focus on their neighbors and surrounding areas. HTED’s program, The King’s Pantry has been feeding those that are hungry within the Greater Bridgeport area, and surrounding towns for over 25 years. This organization was present during 911 and the Katrina incident with donations. The King’s Pantry has a kitchen without walls. Never missing a Sunday, with the exception of the Blizzard of 2013, The King’s Pantry’s familiar white truck is there to feed all those who stand waiting for their sandwich and hot coffee in the winter and a cool drink in the summer, often accommodated with donated pastry. 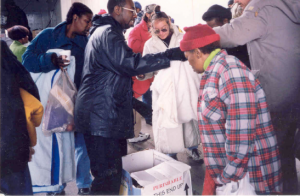 During the winter months, the giving can be accommodated with hats, mittens, gloves, coats and blankets. Then from Tuesday to Friday, there are emergency pantries for families and individuals desirous of food. HTED holds “Financial Aid Symposiums” for high school students looking forward to, and determined, to attend college. Many students in the area are first generation college students and participate in an informative skill-building seminar on how to get money for college, the experience of the admissions process, and how to adjust to college life. Other activities include: life skills program and academic support services for desired classes, in grammar school, high school and college students. HTED also sponsors a co-ed etiquette training summer program, “Manners Matter,” for youth and teens ages eight to eighteen. This training enhances the respect for self, adults, values, character, integrity and their bodies as well as correct manners. HTED understands the importance of family and the support that many families need today. It is through this understanding that we host Parenting Classes that inform parents of different ways to care for their children’s financial, emotional and physical well-being. These seminars also encourage the parents on becoming proactive with their well-being, education and life support skills.